The 1965 hit “Keep On Running” by The Spencer Davis Group must surely be a favourite of Society member Catherine Parkinson. 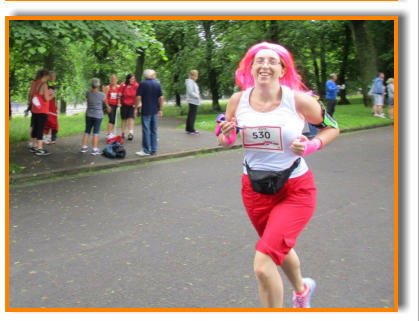 Catherine is a young lady who believes in getting where she wants to go to in a speedy fashion – so she runs a lot! 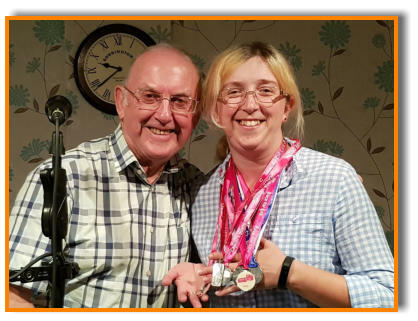 Catherine has been pounding the pavements and running through the Yorkshire hills and dales surrounding her home town of Bradford whenever she can to keep fit and to raise funds for a very important charity. 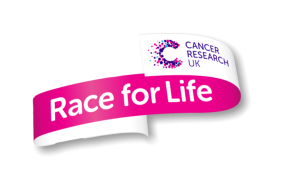 This athletic young lady has involved herself with the Race for Life cancer research appeal, which is a ladies only running event that Catherine has competed in every year for the last ten years. 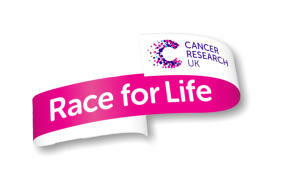 In that time she has encouraged her friends to support her efforts and she has managed to raise over £5,000 of vital funds. She is also a keen supporter of the Bradford Bulls rugby league team and it goes without saying that she also supports the George Formby Society and the Yorkshire Ukulele Circle. 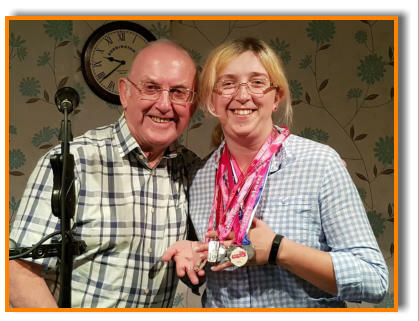 Catherine is photographed at a recent Yorkshire Ukulele Circle meeting proudly showing the ten medals she has received for competing in a decade of Race for Life events. Well done Catherine, a great achievement!